The W31089M7 is one of Cartier's Pasha Seatimer series model. An adorable Swiss watch that is simply a must have for watch-loving men. This Swiss made Cartier watch features an elegant scratch-resistant synthetic-sapphire dial window, a stainless steel case with a stainless steel bracelet, deployment clasp, unidirectional rotating stainless steel bezel, a screw down crown with blue ceramic cabochon, and a solid case back. Its handsomely crafted 42.5-millimeter case, bezel, and bracelet are featured in a high quality stainless steel. In addition, the W31089M7 model wristwatch's dial has three sub-dials for its chronograph functions with 30-minute, 60-second, and 12 hours subdials, plus, date displays between 4 and 5 o'clock. This automatic timepiece's dial come with a white dial with luminous hands and stick hour markers, arabic numerals mark the 3, 6, 9 and 12 o'clock positions, and a minute markers around the outer rim. The watch features a precise, automatic movement. This beautiful piece is water resistance up to 100 meters / 330 feet. This Cartier Pasha Seatimer's original price is $9,200. 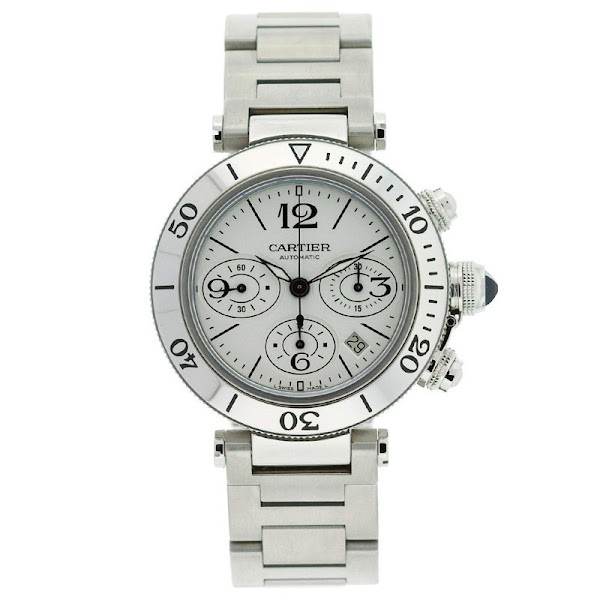 You can find an original Cartier W31089M7 Watch at the site(s) listed above. However, we don’t guarantee its availability as being listed here simply means that those site(s) has the item in question by the time we wrote the review.